2draw.net - boards - Beginner - Everyone on 2draw throwing apples and oranges at Hakkai. 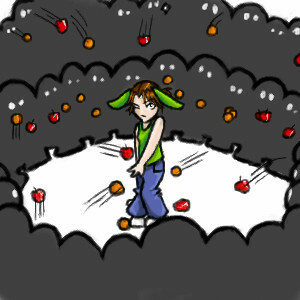 boardsbeginnerEveryone on 2draw throwing apples and oranges at Hakkai. Hakkai, I am so sorry. -___- But I have no will when it comes to Armando. banana? i think this calls for the heavy artillery *whistles and the tank rumbles out, and noremac hops in* anti riot squad FIRE!!!.... AT HAKKAI! hm. when i saw the thumbnail i was gunna throw various dead animals at whomever. but i get the love here. XDDD from my sukkfest, more like throw stuff at me.. >.>;; i hate my rants..
nobody's throwing anything. we're all just donating healthy food to poor skinny hakkai. Oh, is that what you meant when you asked me to draw this, Mando? Hey, do you guys see the one that is grey and has white eyes? that one is me! funny pic. VV.